So I went to the Brisbane craft and quilt fair with my mother today. It was a lovely day out, we got in about 10 and didn't leave until after 2! I could have kept going but my feet were falling off. It was twice the size as the show we went to at the beginning of the year but the stall I wanted was there. 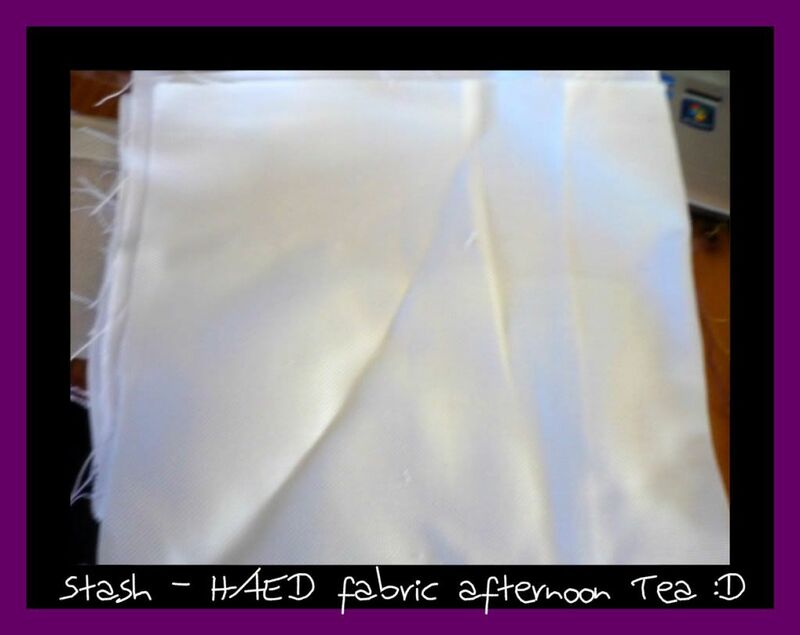 I got some more fabric some white 25ct evenweave for my HAED. They had run out of the antique white but don't think it will make any difference. There is enough here to make my lovely afternoon tea and the threads are winging their way here right at this moment. I also went around the edge of all my fabrics this arvo with the overlocker to seal them off so I am one step closer to starting the Winter Fairy. I also bought a white aida from this place as well. It is barely anything to buy the fabrics from this place. Nothing like the cost it is at spotlight. Sorry I don't have a picture of the aida it's still in the roll. 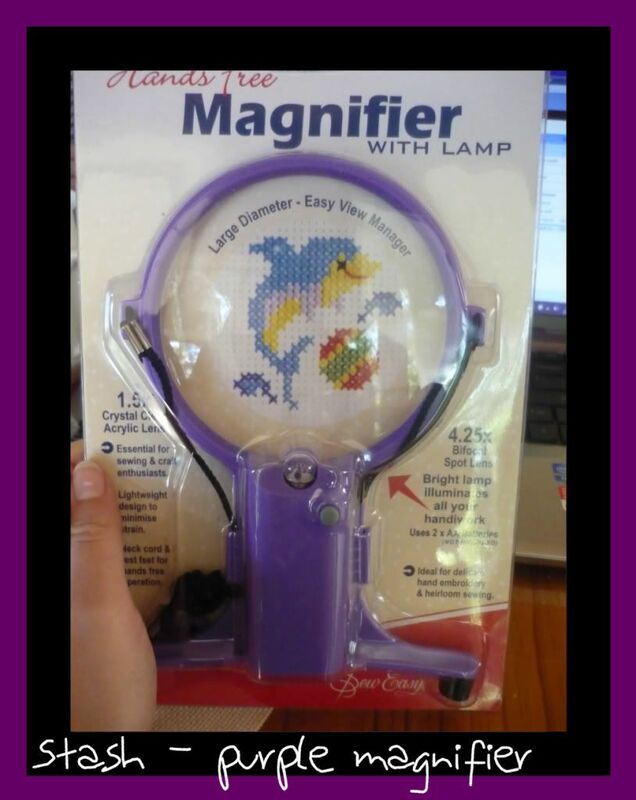 As we were wandering around I found a magnifying glass that was purple and hangs around your neck so I had to get it :D It is pretty and purple. I also bought a new kit called Beacon at Daybreak I've been eyeing this off for a while. I love lighthouses and I had to choose between this and another one. 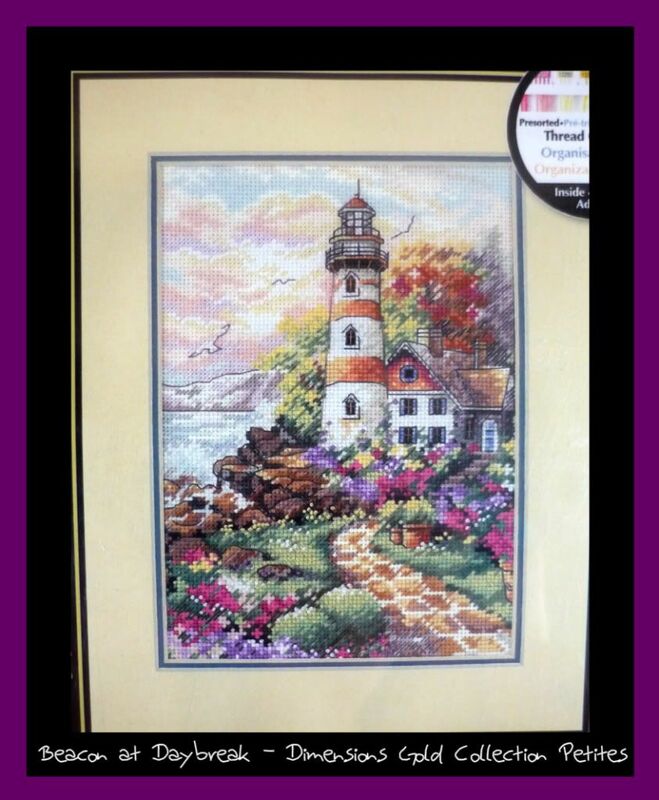 There are lots and lots of french knots in this design for all the flowers at the front. Those white dots are french knots. Glad I enjoy them. I found so many interesting and wonderful items I'm just glad that I limited the money I could take in. All in all it was a profitable and WONDERFUL day out. Hi, I just discovered your blog after seeing you had visited mine. You have stitched some great designs and your stitching looks beautiful. I really adore the see no, hear no, speak no frogs in your header - they are so cute! I will be looking forward to seeing your progress for the WIPocalypse next year. I haven't decided what I am going to focus on yet! What a fantastic day you had, Caitlin!! :D I love doing french knots too. Sounds like an awesome day, the kind I live for :-) congrats on all of your new stuff!